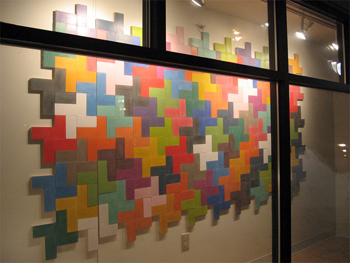 Patrick O’Rorke uses pattern, color and text to convey ideas on music and contemporary culture. He combines disparate elements such as houndstooth, heavy metal album covers and fluorescent paint in his collaged and appliqué-constructed paintings and installations. His latest work "Take off Your Shoes, But Not Your Socks" is currently on display in the Whitney Art Works-curated window space at Walker Terrace.